The firm has received 35 reports of regulators malfunctioning, including three reports of singed arms and two reports of burned or singed hair. The model number of the grill is located on a rating label located on the underside of the grease tray. 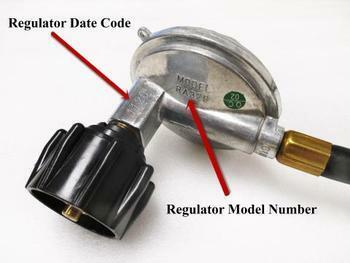 The regulator date code is stamped on the regulator adjacent to the gas tank connection, and the regulator model number is on the center of the regulator. The grills and LP regulators, manufactured in China, were sold at specialty outdoor living stores nationwide, including Family Leisure, Fortunoff Backyard Store, and Watson’s, and through authorized websites and catalogs including Bed, Bath & Beyond and Frontgate, from September 2011, to May 2017, for between $800 and $2,000. The price of the LP conversion kit ranges from $90 to $105. The warranty parts were also sold as service parts for between $50 and $110. Consumers should immediately stop using the recalled grills and regulators and contact Saber for a free repair kit with installation instructions. A video on how to install the replacement components is available at www.sabergrills.com/Support/SafetyBulletins.aspx. Consumers may contact Saber Grills toll-free at 866-671-7988 from 8 a.m. to 6 p.m. (ET) Monday through Friday and 10 a.m. to 3 p.m. (ET) Saturday, or online at recall.sabergrills.com for more information.